WORT disk jockey and long-time music journalist Sal Serio (“D.J. 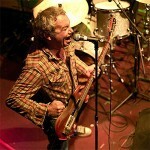 el Serpentine”) interviews indie bass legend Mike Watt. Please listen on Thursday, Sept 25, at approximately 8:30 pm during “Psychoacoustics” for Part 1 of this special, and Part 2 on Friday, Sept 26, at approximately 3:30 pm during “Who Cooks For You”.